DiviningRod gives you programmable social compasses that can point to any location, object, or player. New targets can be created by placing signs. Use this plugin to tell others about interesting places or to find moderators and other players. The compasses are represented by divining rods which are represented by glowing sticks that wiggle. Every divining rod has a tag which tells it where to point to. If a tag has multiple targets, the most relevant will be used. While holding a divining, the distance to the target will be shown in the item name. Walk around to cause the rod to wiggle and update the distance. Create new targets by writing hashtags on signs. DiviningRod is part of the HeapCraft Collaboration Tools. You'll find the source code and a test server with the plugin installed on that site. The plugin versions found at heapcraft.net may not have been approved by the BukkitDev staff. Use them at your own risk. DiviningRod sends anonymized usage data to http://mcstats.org/. Set opt-out: true in PluginMetrics/config.yml to opt out. A divining rod is created by converting a wooden stick. Use the command /find <tag> while holding a stick item in game. A new tag can be assigned by reusing the command. /find stick reverts the divining rod to a regular stick. If the player has no item in hand, a stick will be given automatically. Multiple rods with different tags can be created, stored in chests and given to other players. Use different sticks to avoid retyping commands. If chat is covering the distance, click anywhere to show the distance in the console. This also shows the number of targets which can be found with the current tag. If you don't want to be found, use the command /dr hide on to stop any divining rod from eading to you. /dr hide off reverses the process and /dr hide shows the current setting. The full list of features, tricks and settings can be found in the user manual. 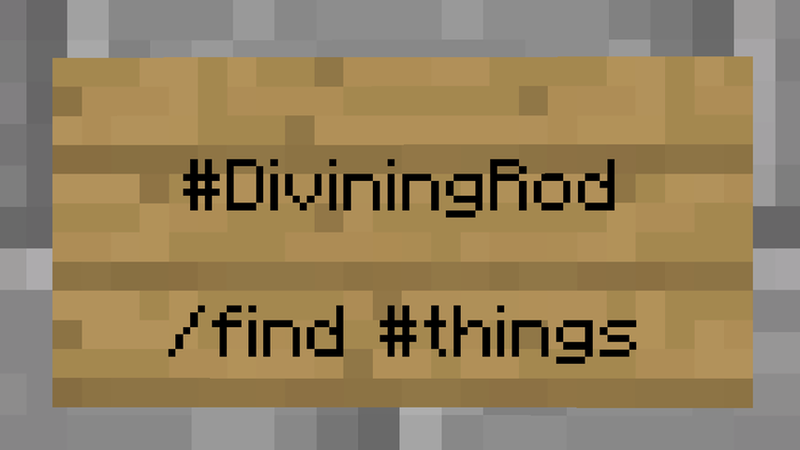 You can test DiviningRod on the HeapCraft test server. Let me know what you think about DiviningRod or what new feature you would like to see on @stepmuel or via pm. Without the Epilog plugin installed, only the basic tags will be available. Points to the nearest players. Points to the nearest operator. Points to the player with the given name. Points to the nearest sign containing the given hashtag. Points to the server's most experienced player. Points to the server's most social players. Points to the player having traveled the furthest. Points to the player having broken the most blocks. Points to the player having placed the most blocks. Points to the least social player. Points to the player having traveled the least. Points to the server's newest player.